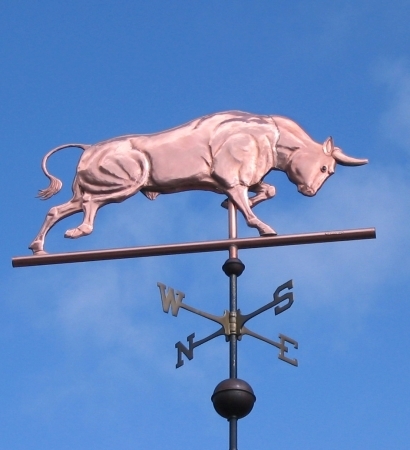 A very action oriented weathervane design, the Charging Bull Weather Vane pictured here was crafted entirely in copper, although we have made several with optional gold leafing on the bull’s horns and/or brand for dramatic effect. It was originally commissioned by a stockbroker who is naturally very much into the ‘Bull Market’. We also offer several Bear weathervanes if you are interested in making a set of weathervanes depicting both a ‘Bull’ and a ‘Bear’ market! On an entirely different thematic track, we have talked with several potential customers about transforming this into a Bullfighter weathervane by adding a Matador. The bull in this weathervane would lend itself perfectly to a Bullfighting Weather Vane. The Bull is an iconic image featured in mythology from around the world. It is also a popular contemporary icon and mascot. As a symbol of aggressive financial optimism and prosperity, the famous ‘Charging Bull of Wall Street’ is also depicted with its head lowered and ready to charge. The Chicago Bulls, a professional basketball team based in Chicago, Illinois uses the logo of a fierce red bull whose horns are tipped with blood. Their use of the bull has its origins in the rise and dominance of Chicago’s Union Stock Yards when Chicago was the only connection for transporting livestock from the West to the rest of the country. 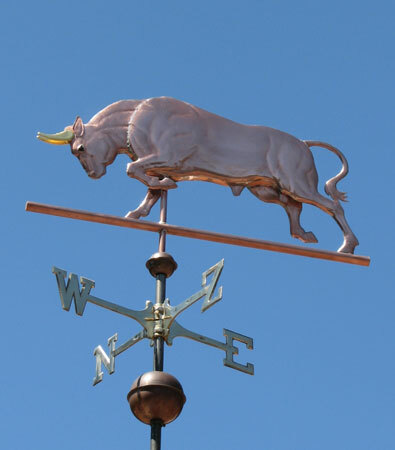 So whether you are a financier, a bullfighter or a cattle rancher, the power and symbolism of the Charging Bull Weather Vane may fit the bill, whether it is displayed atop a beautiful home in a gated community or atop a large barn, ranch entryway or livestock shed.